U.S. stocks suffered steep losses as investors' concerns over the financial health of European sovereigns triggered a flight to safer assets. Investors focused on negative headlines from the Continent over the weekend where S&P cut its outlook on Italy's credit rating to negative from stable. Adding to the downbeat tone, Spain's ruling Socialist party suffered devastating losses in regional elections and Germany’s ruling party were humbled in a vote in the city-state of Bremen. Sentiment wasn’t helped by slower May manufacturing data from China that came ahead of similarly downbeat PMI numbers from Europe and particularly Germany. A rally in the greenback added to the woes however the sliding euro pared its losses after European trading ceased and that helped to prevent further downside in the major U.S. stock averages. The Dow Jones Industrial Average dropped 130.78 points, or 1.05%, to 12,381.26. The S&P 500 slid 15.9 points, or 1.2%, to 1317.37. 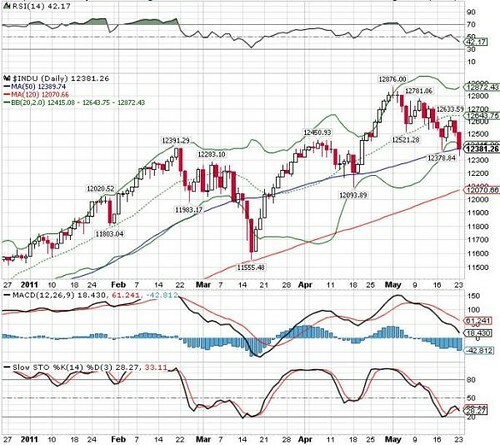 On Wall Street, with the breach of key supports of 50-d SMA coupled with the mid and lower Bollinger bands, the Dow is likely to extend its downward consolidation for a while despite plunging 3.8% from 52-week high of 12876. Critical support is 120-d SMA of 12070. A breach below this support will drag the index lower towards 11555 (16 May low). The European Union is selling EUR4.75 billion (US$6.7 billion) of 10-year bonds to help fund the bailouts of Ireland and Portugal. The EU is offering the bonds through its European Financial Stabilisation Mechanism, or EFSM, according to three people with knowledge of the transaction, who declined to be identified before it’s completed. The deal is the third from the fund and follows Portugal’s request for rescue loans on 7 April.